Description: This slide deck depicts Doug Engelbart's call to action in an interactive visual format. 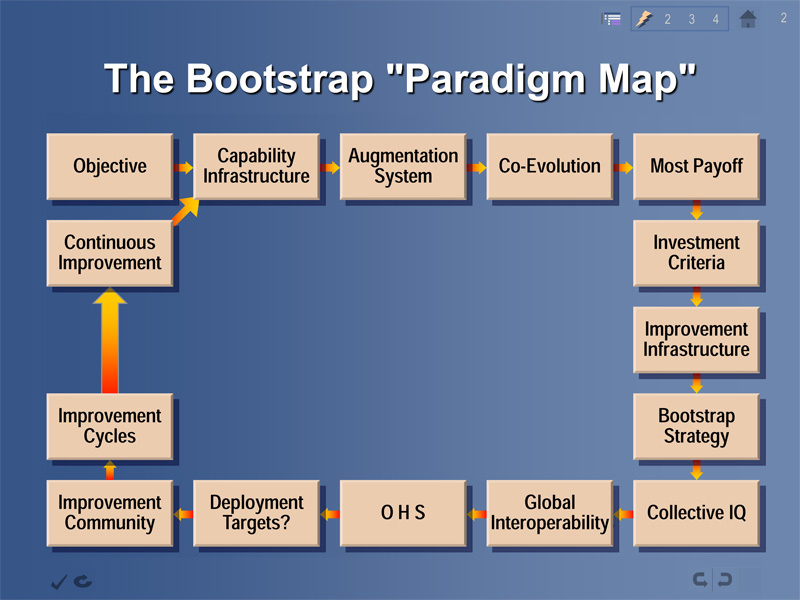 The Bootstrap "Paradigm Map" highlights the paradigm shifts needed to accelerate our advancement of Collective IQ in business and society. Travel once around the map (shown at right) to see vision highlights, and again to see vision and strategy in greater detail. . Description: Christina's presentation at the 2011 Conference on Personal Digital Archiving at the Internet Archive, San Francisco, CA -- a 20-minute whirlwind tour of (1) Doug's seminal work, (2) this archive initiative, and (3) how his work informs next-generation information technology. Learn more about the ongoing initiatives of the Doug Engelbart Institute featured in this presentation, at the Doug Engelbart Archive Initiative and Doug's Call to Action (particularly Collective IQ and OHS). Description: Christina's presentation at the Spring 2010 gathering of Patty's Visionaries in Austin, TX. To learn more about the ongoing initiative of the Doug Engelbart Institute featured in the presentation, visit our Bootstrapping Innovation resources page. Doug's slides and reading handouts from his three-day management seminars are in the Seminar Binder. You can also find description and links to the complete video of all twelve sessions. The Driving Vision (Dec 2008) - [ watch video; view slides PPT | PDF ] Christina Engelbart's presentation at the Engelbart and the Dawn of Interactive Computing event in 2008. A personal tribute to her dad, including a brief overview of his strategic vision that drove the innovation in his lab up the S-curve (see Doug's Vision "Treasure Map" at right), closing with a call to action and appreciation. 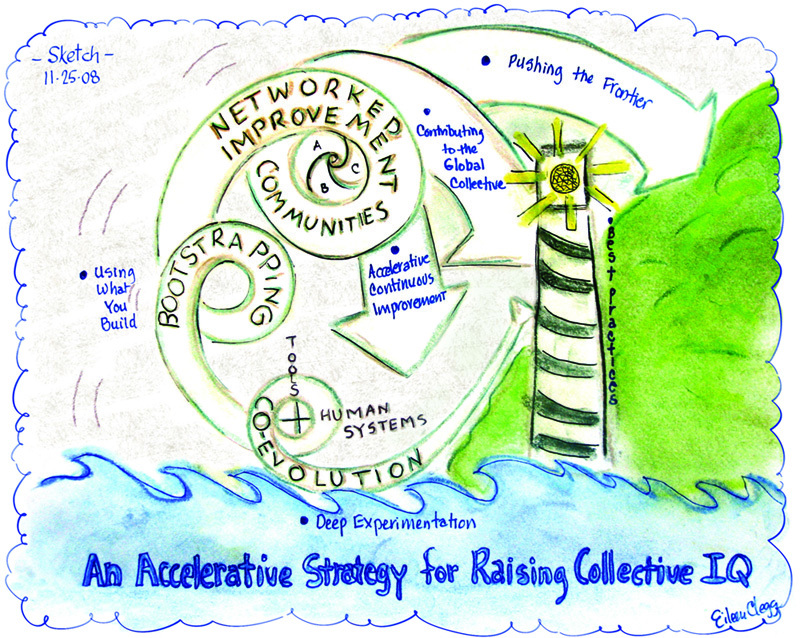 "What if we could take the same breakthrough vision and strategic organizing principles, with built-in accelerators that Doug embeded in the inner workings of his lab with such unprecedented results, and embed those in today's teams and organizations, using next generation interactive computing as a springboard ... just imagine the incredible levels of innovation that could be unleashed!"